I'm a shoe gal...said most women everywhere. 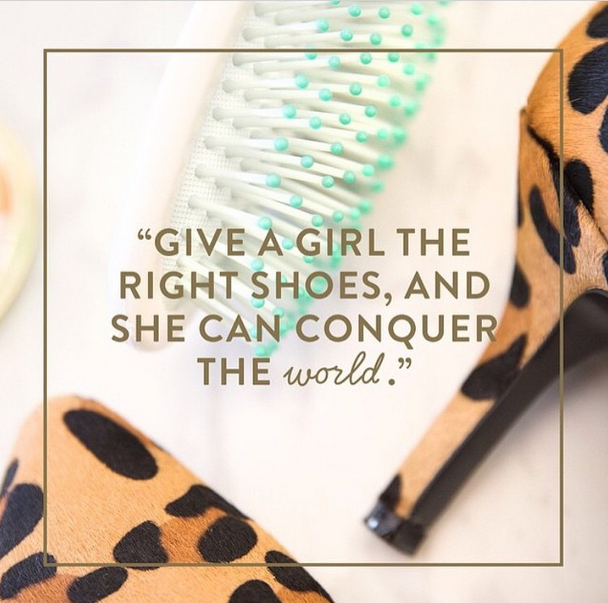 I've always been a shoe lady and most likely will always follow suit on this passion. I've done the leg work on all kinds and types, have the blisters and scars, and lack of closet space to prove it. In no particular order of preference, I have experienced the love and joy of the following types of shoe: wedges, espadrilles, stiletto, high rise boots, bootie boots, ballets, peep toe, gladiator, oh my! And of course there was that unfortunate phase of kitten heeled. Le, sigh. We've all got demons. What I've learned in my years of connoisseurship for feet accessories, is that the quote in the above picture is beyond correct. Whenever I need to hustle in the utmost of style, I've got my go to foot ditties. When the time comes to hustle in style yet comfort, I know. When the time calls for who cares how I feel, how do I look? ?...I'm on it. But for every instance we can imagine, the truth is in the footwear. With the right pair of shoes, I can in fact conquer any world I am living in. It's just, like, science.